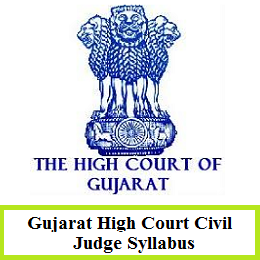 Download Gujarat High Court Civil Judge Syllabus 2019 PDF through this article. Moreover, the higher authorities of the Gujarat High Court are planning to conduct the Civil Judge Prelims Exam on 5th May 2019 and Mains Examination on 7th July 2019 only for the applied candidates. Aspirants can download the Gujarat High Court Civil Judge Exam Syllabus 2019 from the link which we have provided below. So, we suggest all the aspirants to start downloading the Gujarat High Court Civil Judge Syllabus 2019 PDF for free of cost from this article and start the preparation. Candidates need to check each and every section of this page to get the more stuff about the ગુજરાત હાઇ કોર્ટ Syllabus 2019. In the upcoming sections of this page, we have also given you with the particulars of the gujarathighcourt.nic.in Exam Pattern 2019, GHC Civil Judge Selection Process 2019. Check the related GHC Exam Pattern 2019 given in the below. You can easily refer to the Prelims and Mains Test Pattern which was assigned by the Gujarat High Court officials. So, you need to make a move according to the ગુજરાત હાઇ કોર્ટ Test Pattern 2019. The Preliminary Examination (Elimination Test) shall be of 100 Marks, the duration whereof will be 2 Hours, consisting of Multiple Choice Questions (MCQs) each of 1 Mark with Negative Marking of 0.33 Mark for each Wrong / Multiple Answer. The Main Written Examination shall consist of Three Papers, based on the given marks and time duration. Below is the direct link that gives you the concerned Gujarat High Court Civil Judge Exam Syllabus 2019. Furthermore, by more preparation with the topics, subjects you can easily strive and gain more mark in the test. And you need to make sure that the test preparation should be completed in time. So, all the candidates need to concentrate more to attain the Civil Judge post. Within the single click, you can easily get the Gujarat High Court Civil Judge Syllabus 2019 PDF. We have also listed out the topics required for the GHC Civil Judge Written Test 2019. Follow us on our Freshersnow.com for the latest updates and alerts.